Despite all the warnings about the central Asian police, the journey through Kazakhstan went absolutely smoothly. Every time a member of local police said the magic word “straf” (fine), we were quickly able to persuade him about our innocence – until we reached Almata. As the quality of the road increases, so does the number of speed controls. The number of various speed limits and signs, on these otherwise non-problematic and clear stretches, is tremendous. I (Yarin) was the first one to fall into this trap. There was just a little turn on an otherwise absolutely straight stretch and I was controlling the quality of the asphalt. I therefore failed to notice and absolutely ignored a smiling policeman with radar in his hands, and even accelerated. I was then forced to stop, he took away my license and I had to go to his police car. This was then followed by the exact same procedure, as always in the past – we agree on a bride (half the amount of the official fine), shake hands, he wishes us a pleasant journey and we continue. A few days later I pay another fine, this time for driving 51km/h (just like any other vehicle around me), where the speed limit was 30. This time the policeman even warns me that 2km in front of us, there is another police car measuring speed as well, so we should be careful. Me and Alin laugh and 2km later we happily pass this police patrol at 30km/h. Unfortunately in those 2min of driving I forgot to turn on the headlights and so we get another fine (fortunately much smaller) and continue. Our happy journey however, doesn’t last very long. Only half an hour later we drive through a small village at the Kirgizstan border and are stopped again by a policeman. I had no idea why – I knew I was able to slow down to 40 on the first stretch and 20 on the second, in time. The photos from the radar prove this. However due to the amount of various signs all over the place I missed the sign “50” and drove 62 on a stretch even before those two. The policeman looked at me and maybe somehow guessed I have already got a few fines that day because he said I am a guest in his country and he would therefore forgive me. “Have a nice journey”. Unbelievable! As we got close to Astana we entered the next “level” of this police game. The policemen began to control our car insurance as well. We originally crossed the Kazakhstan borders with the vice-consul Adil so no-one really checked we had everything we should in order. We were almost certain that our Green card doesn’t cover this country. All we could do was to improvise. When entering the city, Alin is questioned about this, but when he mentions our close friendship with the members of Kazakhstani national power, he is immediately released and we can continue without any problems…. From Astana we continue via Pavlodar to Russia. The following day we wanted to cross the borders, but Alin’s health was against this idea. We had to park the car just in front of the borders because his fever reached 39.5°C. It didn’t get any better during night so the next day we had to take our car, cross the borders, and drive 400km to Novosibirsk. We found accommodation and arranged a doctor to come and see him. After a brief check-up the doctor decided to take him to the hospital so that a specialist can see him. In the hospital we were told it is angina and that they do not have places available in the hospital so we returned to the hotel. After 4 nights spent in Novosibirsk we transfer to Barnaul. Both of us agreed that Altaj is an absolutely fascinating landscape – especially after spending one month in the dried-out Kazakhstan. For two days we drove through an unrestrained landscape full of steep slopes, wild rivers, forests, snowy mountain tops, deep valleys and furthermore met with many kind people. We spent one night in a rented cottage near one of the road snack bars. The owner came to us in the morning to have a little morning chat and it turned out into drinking of vodka and tasting of maral until noon. We then said goodbye and headed towards the Mongolian border. Because the road from Tašanta to Tsagaannuur is not very busy due to its remoteness, we expected it to go smooth and fast. Unfortunately, we have no control over the speed of working of local officers – if not the opposite. The smaller the amount of work they have, the slower they work. After a few weeks we met here another tourist. It was an older German motorcycle driver. He and his friends entered Mongolia that morning and now using hand language he was trying to explain to the customs officers at the Russian border, why they are coming back. 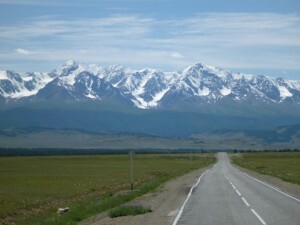 It was obvious that Mongolian roads are not his cup of coffee and that he wants to continue to Baykal via Novosibirsk. After driving 20km through a land of nobody and reaching 2500m above see level the asphalt road suddenly ends and we were at the entrance to Mongolia. To reach the customs office it is then necessary to drive a few more km down to the valley. We got there at approximately quarter to six local time. We are told that they finish working at 6PM and so we have to wait until the next day. Fortunately we were able to persuade them and they clear us immediately. After all these procedures we must cross yet another customs office, which makes profit by exchanging money at a very disadvantageous exchange rate. Unfortunately we need local currency so we are forced to exchange some. What we’ve experienced in Mongolia will be covered in the next article. Příspěvek byl publikován v rubrice Kazakhstan, Russia. Můžete si uložit jeho odkaz mezi své oblíbené záložky.